Lean Project Management relies on efficient processes: With the customer benefit always in mind, unnecessary efforts are eliminated. Learn more about this approach and its principles. 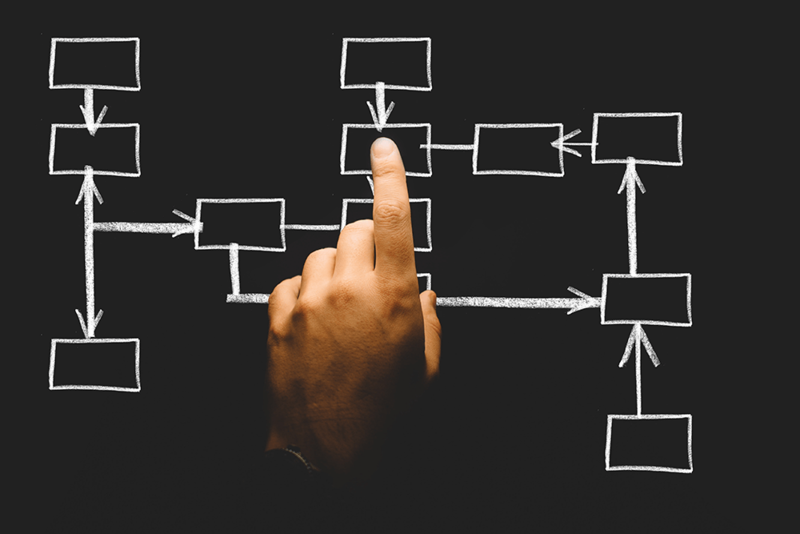 In the last blog post on process optimization in project management we introduced you to the 5-S framework, which is also very popular in Lean Management. Therefore, we will now deepen the topic Lean Project Management. Create more value through less waste! Waste stands for any kind of resource consumption that does not contribute to the achievement of the project's objectives. Lean Project Management is derived from Lean Management. This approach goes back to the Japanese Taiichi Ohno, who was production manager at Toyota and is also credited with the invention of Kanban. Lean Project Management is based on the same philosophy as Lean Management: eliminating unnecessary wastage of resources and time, and thus focusing entirely on the needs of the customer and the value of the product being targeted. Throughout the entire course of the project, you should always keep the customer's benefit in mind. Attention: A certain degree of flexibility is required here! This approach may lead to a change of direction from time to time. In order to avoid non-value-adding activities, the project manager needs strong determination. In Lean Project Management, the project team focuses much more on the final project result than on the individual tasks. In order to keep all project participants up to date, visualization is particularly important. The project status, for example, can be easily visualized and prepared with the help of project management software. The Kanban board or a detailed project plan (Gantt chart) can be used for this purpose. Now you are probably wondering which processes are obsolete and where you are wasting time and money in your projects. Lean Project Management does not provide a general workflow that is applicable in a standard case. Rather, it is a way of thinking and thus a very individual approach to process optimization. In Lean Project Management, traditional processes such as project planning, control and completion are also run through - only with a much stronger focus on greater customer benefit! As with many other approaches, Lean Project Management must be introduced holistically at all company levels. The five principles of Lean Management, which can also be applied to Lean Project Management, form a guideline. Please note that in some projects the roles of the client and the customer have to be differentiated. Which values are relevant for my customer? Analyze which activities in the project generate an actual added value for the customer. Values are created when the activities contribute to achieving the project result, reduce or avoid risks or use project opportunities. From the customer's point of view, it will be much easier for you to separate useless tasks or processes from the actual value-added chain. A project structure plan can be very helpful in this step. Based on this plan, you can then conclude which activities really create value. Which steps/interactions lead to these values? The value stream describes all activities that are required to produce the product or service. In project management we also speak of the project process. This step is about finding out which steps or interactions are necessary to get from the project start to the end and thus to the delivery of the defined result. All participants, resources and corresponding interfaces are analyzed for this purpose. How can a flow be created by dropping ballast? The flow principle involves optimizing the entire project process and not just looking at individual sections. Ballast describes everything for which the customer would not be willing to pay (e.g. multitasking, inefficient meetings, lack of prioritization). It is now important to only implement the value-generating steps in the project and to eliminate unnecessary effort. In order to make these value-adding steps measurable, the resulting tasks are assigned to the team members. Make sure that the tasks are truly assigned according to the strengths of each team member. Pull instead of push: We leave the pace of work to the customer - capacity load is not the decisive criterion, but the existing demand. This means that the customer must be integrated into the flow. The customer specifies what exactly he considers relevant for the project goal and what not in order to avoid unnecessary work. To ensure that only the desired project results are actually implemented, it is necessary to apply the previous four principles continuously and cyclically. It is therefore a matter of constant reflection and questioning of the approach in the team and together with the customer. Process Optimization in Project Management (3): Lean Project Management - InLoox • Copyright 1999-2019 © InLoox, Inc. All rights reserved.